The National Weather Service Moves to a New Global Model: Will It Do it Right? This week the National Weather Service (NWS) made an important announcement: its decision for the dynamical core of its new global model, the Geophysical Fluid Dynamics Lab (GFDL) FV-3. At the same time, they turned down the global model developed by the National Center for Atmospheric Research (NCAR) called MPAS (NCAR is the combined entity of the academic research community of the U.S., representing over 100 college and universities). Some issues regarding this decision. Some recomendations on the route the NWS must take if it wants to develop a world class global modeling system. As I have discussed in several blogs (e.g., here), the current NWS Global Forecast System (GFS) is out-of-date in many ways. It was designed for low-resolution weather prediction and does not scale well on modern supercomputers (which can have tens or hundreds of thousands of processors). GFS physics (the descriptions of physical processes such as convection and clouds/precipitation) are ancient, representation the state of the science 20-30 years ago. The range and amount of data assimilated into GFS forecasts is less than leading centers (such as the European Center) and the quality control system lags. We can do much better. 72-h cumulative precipitation from the GFS forecast initialized at 1800 UTC 30 July 2016. The "popcorn" look to the precipitation in mountains is not realistic and reflects inferior, 20-year old precipitation physics in the model. The NWS GFS global model is now third or fourth globally, a particular embarrassment since the range and quality of US. weather research is by far the greatest in the world. The general U.S. population finally understood the situation when important forecasts by the GFS (e.g., Hurricane Sandy) were clearly inferior to those of the European Center and UKMET office. So does NWS/ NOAA management and Congress, which provided funds for both a new operational computer and model replacement. 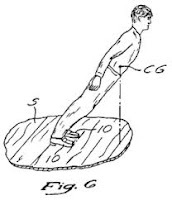 The first step in moving to a new modeling system is to replace its guts: the dynamical core. But what is this? A reasonable analog is the chassis of a a car, including the frame and engine (see below). 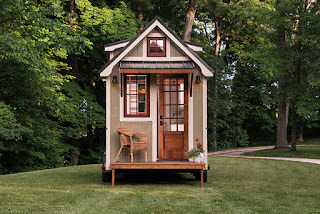 No body, no seats, no electronics, no AC or ventilation, no steering column, no gas tank. 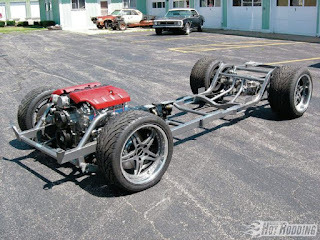 Although it is perhaps 25% of what makes up a modern car, the chassis does serve as the frame on which everything else is mounted and connected. To build the best car, you want a good chassis. Numerical prediction dynamical cores are like that. 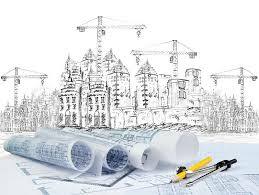 They provide the framework of the model: its grid structure, the central atmospheric equations (conservation of mass, momentum, energy, and water substance), how the model can provide more detail in local areas (e.g., nesting or variable resolution grid elements). The dynamical core does not take encompass key physical processes, such as boundary layer drag, condensation in clouds, radiation from the sun/clouds/surface, and much more. And the core does not deal with the critical element of data assimilation, taking all of the sources of weather information to create a physically consistent initialization, or starting place, for the forecast. So a key point is this: although the National Weather Service picked a dynamical core, MOST of the work to develop a state of science global model for the US is still ahead. The announcement last week was that the National Weather Service picked the FV-3. In some sense, it was the safe choice, but I believe it wasn't the best choice. Let me be clear: FV-3 is far, far better than the current GFS model and the handiwork of a very talented numerical modeler, S.J. Lin. But I believe it was not the best choice for important reasons. The alternative (MPAS) uses a grid structure that is far better at high resolution (like 1-4 km grid spacing), which is where global modeling is going in the next ten years. Thus, picking FV-3 was like buying a house that is good for two, when you are planning on a large family. FV-3 is far more conventional that MPAS in structure (e.g., it has grids, not the hexagonal elements of MPAS) and its compromises make it faster at the same grid spacing. But just as important, picking MPAS would have brought the research and NOAA/NWS efforts together, and I believe the lack of nation cooperation is one of the key reasons US operational NWP is lagging. But the decision, good or bad, has been made, and as noted above, the dynamical core is perhaps 25% of a modern modeling system. As Caesar would say, the die has been cast. And if future testing supports the superiority of MPAS, its dynamical core could be switched for FV-3. So What Should Be Done Now? The National Weather Service needs a plan to complete the remaining 75% of the new global modeling system and to ensure that it is state-of-the-art and STAYS state-of-the-art. The trouble? They don't have a plan at this point and need to put it together immediately. Actually, they need TWO plans: a broad strategic plan on where they are going during the next ten years, and a shorter term implementation plan for the next few years. Planning has been a singular weakness of the National Weather Service weather forecast modeling efforts, with a tendency to do too little of it, and what they have done has been in-house with inadequate vision. It is clear that NOAA/NWS needs to open up the planning process to include the research community, the private sector, and others. They have done a bit of this with the NCAR UCACN and UMAC committees, but they need to take the planning process to a completely different level in detail, vision, and inclusion. Perhaps, a standing committee that mest several times a year. Let's call it the NOAA Global Model Advisory Committee (NGMAC), with modeling experts from NOAA (ESRL and GFDL), academia, NCAR, the private sector, and other Federal agencies. The committee would recommend a broad strategic plan to NOAA/NWS managemen,t and subcommittees (with additional experts) could build the implementation plans. The history of the past few decades is clear: when the National Weather Service develops models in house without the entrainment of the outside community, the models are inevitably not state of the science. But when they partner with others (such as ESRL working with NCAR on the High Resolution Rapid Refresh, HRRR), amazing things happen. Specifically, NOAA must make the model development a cooperative national effort. Bill Kuo of UCAR , a wise and experienced player in US numerical weather prediction efforts, has suggested a wonderful plan. Center the development of the new national modeling effort in UCAR (the University Corporation for Atmospheric Research), with a center of gravity in Boulder, Colorado (the intellectual center of the US weather community). A team of ESRL researchers, NCAR and academic scientists, private sector modelers, GFDL and NOAA EMC staff) could build the system there. The UCAR Developmental Testbed Center (also in Boulder ) would provide extensive testing of new model components and could organize community support. ESRL, with considerable personnel in model development and basic physics, is found in Boulder. EMC scientists in DC could work on the new system components, complete pre-operational testing, and take on key tasks such as improving quality control. NOAA/NWS could continue and expand its research funding of advances that support the new system and hopefully NSF could help support associated basic research. The future of numerical weather prediction is clearly moving towards unified modeling across all scales. That is the way the real atmosphere works. The days of one model for global forecasts and another at ultra-high resolution are numbered, if not over all ready. Leading groups, such as the UKMET Office, have already moved to a unified approach. NOAA must do the same. Future prediction will be essentially probabilistic at all scales, with ensembles (running models many times with different initial states and physics) being the foundation. The NWS has generally not given enough emphasis and thought to their ensemble systems, with their size and resolution being insufficient. They have also held back from creating a high-resolution (2-4 km grid spacing) over the US, something recommended by endless National Academy reports and national workshops. Ensembles need more resources and thought. US NWP has become risk adverse and conservative. It needs to be more forward-leaning and innovative. The National Weather Service made a conservative choice for the core of its new global modeling system, but that is not the end of the world. The U.S. can still build a far better global prediction system IF NOAA/NWS will methodically plan the development of the model and entrain the large and strong US research community. Such strategic planning and inclusive development would be a very different approach than NOAA has done in the past. Leaders of NOAA (e.g., Kathryn Sullivan) and the Weather Service (Louis Uccellini, Director, and Bill Lapenta, had of NCEP) say they are ready to follow such an approach, and with their support, U.S. numerical weather prediction could move in a new direction. If U.S. numerical weather prediction stagnates because the NWS follows the path of the past several decades, you will know who to blame. During the past week we have experienced a few warmer than average days, although none pushed temperatures into the 90s over the Puget Sound region (see Sea Tac temperatures below, with average max and min values in red and blue). The recent warmth has been associated with a broad upper level ridge of high pressure over the West Coast and eastern Pacific, as illustrated by the upper level map at 5 PM Thursday below. 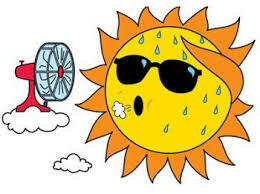 However, the hallmark of this summer has been the transient nature of West Coast high pressure, with the tendency to have periods in which troughing (low pressure) has developed over the region. Such troughing will be happening in spades during the next week, as illustrated by the upper level map for Saturday at 5 PM: a low is centered over British Columbia, with a trough over the Northwest. Subsequently, the trough moves out and is replaced by a strong, small-scale, low centered over NW Washington (see below for 11 PM on Monday). This will bring both cooler temperatures and some precipitation. Fast forward to Thursday at 5 PM. Another low is moving into our area. This time of the year it is hard to get heavy rain even with weak troughing. Thus, the 24-h precipitation forecast ending 4 PM on Tuesday shows some light rain over western WA, but modest wetting over British Columbia. Turning the National Weather Service GFS model, here is the accumulated forecast precipitation over the next 10 days. The West Coast is starkly drier than the rest of the continent, with Oregon and coastal CA being dry. In contrast, the East Coast is soaked. With much cooler and wetter conditions over the Northwest, the number of wildfires has been minimal. With the upcoming cooling, one should expect the continuation of the benign fire season. 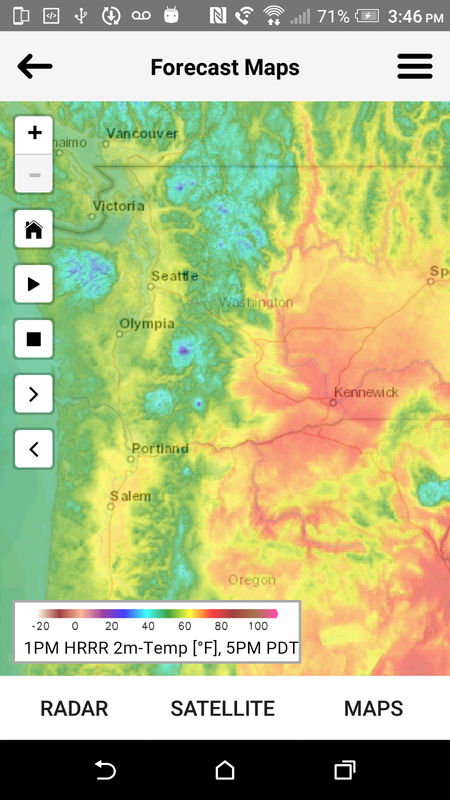 Are Pacific Northwest Summers Becoming More Humid? 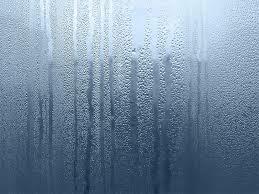 A number of people have told me that Pacific Northwest's summers are getting more humid. Is this true? 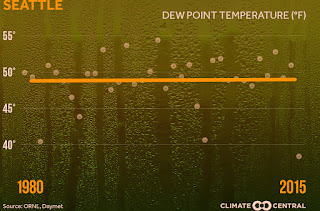 Let's examine this issue by looking at trends of dew point, which is probably the best measure of stickiness and unpleasantly moist conditions. Dew point, the temperature at which the air becomes saturated when it is cooled, is a good measure of the amount of water vapor in the air. If there is more moisture, you don't have to cool as much to get saturation. Thus, high dew points mean more water vapor in the atmosphere. When dew point gets into the 60s F, we start to feel uncomfortable. 70s is unpleasant. 80s are oppressive. I will begin by showing you the daily dew points over the past 20 years at Seattle Tacoma Airport. You don't need to be a meteorologist to see there is no apparent trend, either up or down. You will also notice that Seattle dew points rarely rise to the mid-60s, reflecting our very pleasant climate. 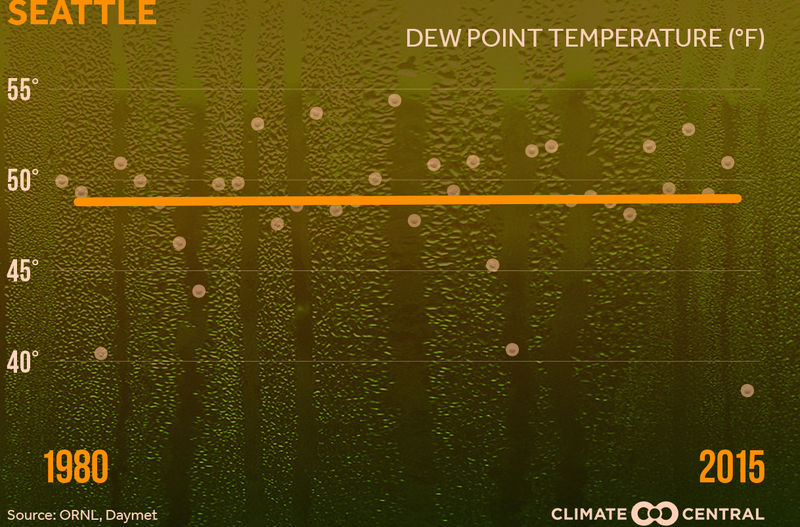 A longer period plot (35 years) for summer dew point at Seattle is shown below. Again no trend. What about Yakima, along the eastern slopes of the Cascades during the past two decades? As shown below, there is no temporal trend there either. Next, let's consider summer precipitation, could that be increasing? More humidity might be expected to enhance rainfall. 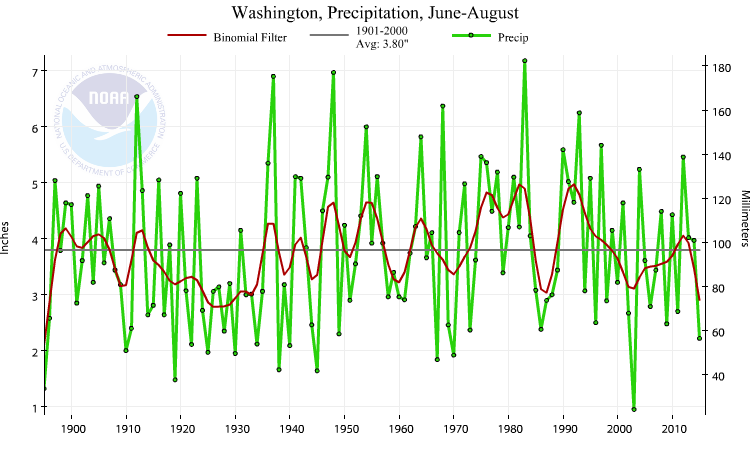 Here is plot of Washington State precipitation over the last century--no apparent trend is obvious. During the past 30 years, there has been a drying trend, if anything. The bottom line of the above information is that there is really no evidence that Pacific Northwest summers have been getting more humid. One of the most extraordinary idiosyncrasies of Northwest weather is the profound drought during midsummer. During a magical few weeks, generally including the last week of July and first week of August, the Pacific Northwest is usually the driest region in the nation. Drier than Arizona for instance. And the latest forecast charts suggest this year will be no exception. Let's take a look at the precipitation climatology of Seattle Tacoma Airport, specifically the climatological probability of getting .01 inches of precipitation over a day. The driest day is in late July (about 8% chance of rain), but late July and early August are right behind--only about a 10% chance of getting one hundredth of an inch, the definition of measurable precipitation. 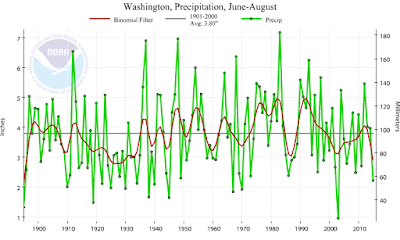 The wettest period? November. What about a significant rain, like a tenth of an inch in a day? Lower chances of course, and a very flat minimum from the second week of July to early August. Really going for the gusto, how about .25 inches in a day? Very low probability over June, July, and August. November really stands out. Why is midsummer so dry? With the jet stream heading north during the summer we get little rain from fronts and midlatitude cyclones. And thunderstorms are infrequent west of the Cascade crest during midsummer due to lack of humidity, a relatively cool lower atmosphere (due to the ocean influence), and few upper level disturbances to give air parcels an upward kick. So if you are planning a wedding, hike, or outdoor activity: do it now. Our weather world will be very different in a month. 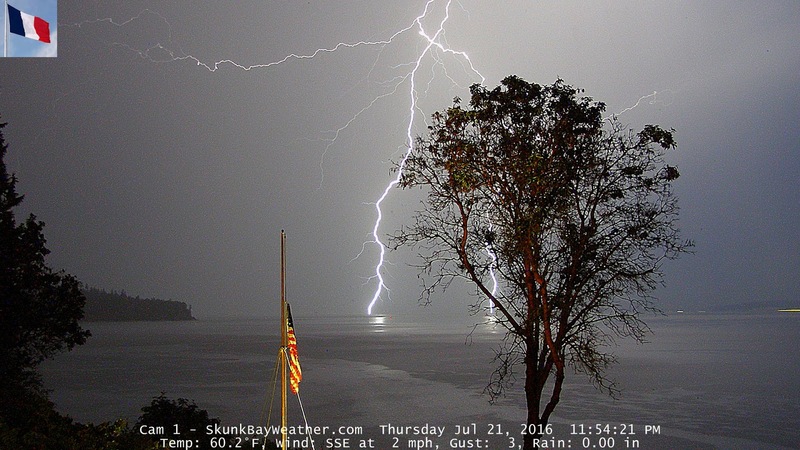 Near midnight yesterday (Thursday at 11:58 PM), lightning was apparent in one of my favorite weather cams (skunkbayweather)--see the image below. A classic with all kinds of forking of the lightning channel in a series of discrete steps. Less than 15 minutes later, the unimaginable happened: lightning nearly struck the cam, apparently hitting the water a few dozen feet away. 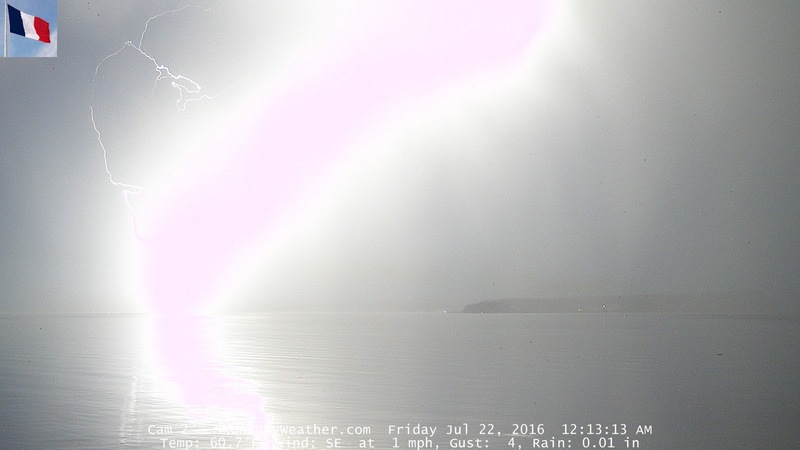 Amazingly you can see the undulations of the lightning channel. You are looking at something that is hotter than the surface of the sun; the core of lightning channels reach roughly 50,000 K (Kelvin), with the surface of the sun only around 6000 K. The huge currents associated with lightning converts atmospheric gases into plasma, with the electrons stripped off the nuclei. A pressure shock radiates from the superheated channel: thunder. 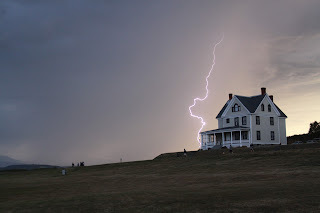 There were many other amazing lightning pictures taken this morning, such as this stunning picture on Whidbey Island (Coupeville, Camp Casey) by Ron Newberry. Lightning detection networks picked up the storms on Thursday night--here is the 24h lightning strikes ending 1 AM Friday. 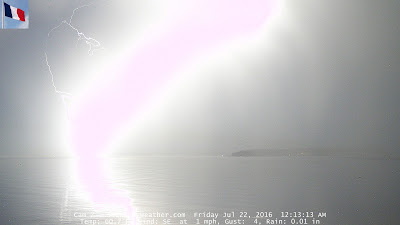 Lots of lightning over the Olympics, with some moving over Whidbey. A lot more lightning over the Cascades. Fortunately, there was substantial rain over the Cascades and the ground is still relatively moist: thus, few fires are expected. Talking about rain, Thursday evening and Friday morning were pretty wet: here are the 24 totals ending 6 PM Friday PDT. A number of locations in the Cascades received more than an inch. The storms and rain are over now, with the next week being warm and dry. Want to make an important contribution to weather prediction? 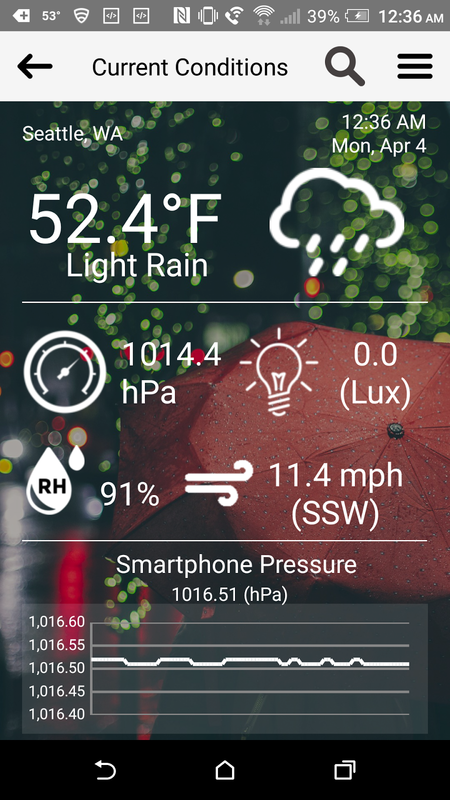 Possess a smartphone app that gives you state-of-the-art weather information? 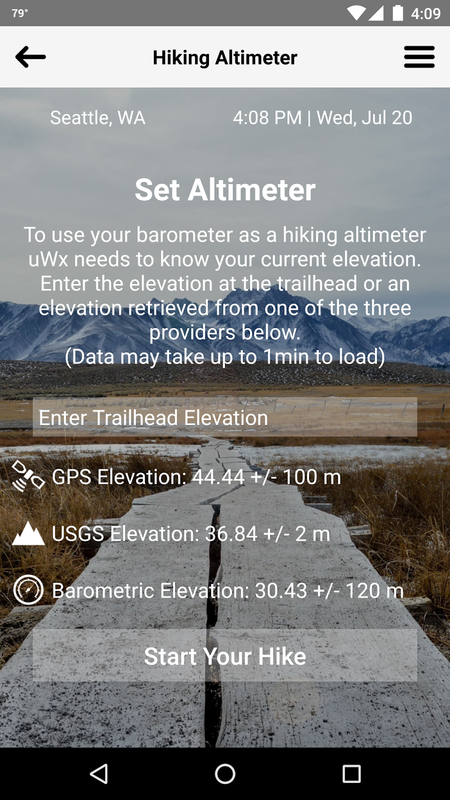 Use an app that will provide an accurate elevation while hiking or other activities? An app that works on many Android smartphones, is highly rated, and is free? An app you can download today at the Google Play store. The app website is here. 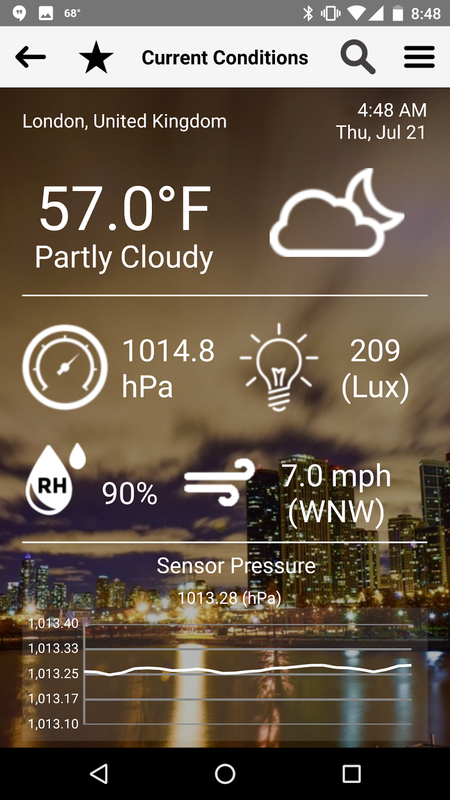 Can pressure observations from millions of smartphones revolutionize weather forecasting? By the end of the year over a billion smartphones with relatively high quality pressure sensors will be in use, producing a surface observing network of unparalleled density and number. Can this data be collected and then used in numerical weather prediction, resulting in substantially improved forecasts? 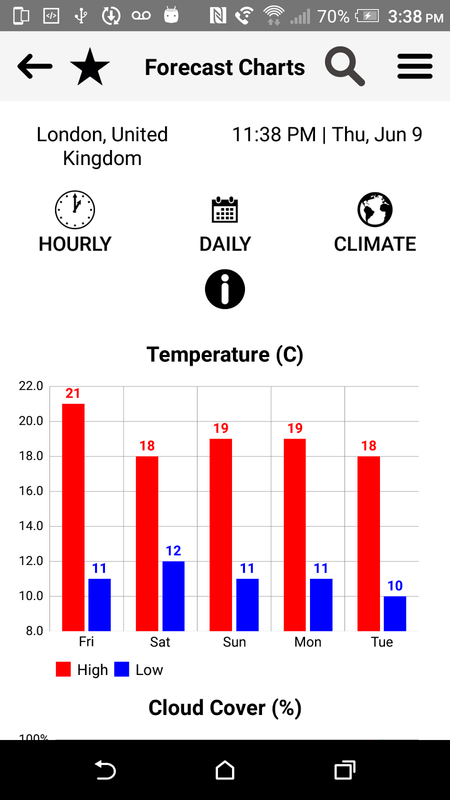 Our initial tests applying smartphone observations used pressures collected by a small firm called PressureNet. The initial results were promising. But PressureNet has gone out of business. We approached Google and Apple to assist us, but so far they are not interested in improving weather prediction. We are talking with a major weather app about including the necessary code, but that hasn't been fruitful yet. Importantly, we need a smartphone platform that will allow us to test a variety of approaches to securing pressures (e.g., how we calibrate the pressures, frequency of observations, knowing when the phone is moving, etc.) And we want to try using the smartphone pressures over places like the Pacific Northwest, to demonstrate value. Our conclusion: we needed to build our own app to give us the flexibility required to push the envelope. And it would have to be so fun to use and valuable that large numbers of folks would want to download it. Thus was born uWx! The author of this app is a very talented UW graduate student, Conor McNicholas. Why Should You Try uWx? 1. The latest weather observations at your current location (or any other)--see screenshots above. 2. 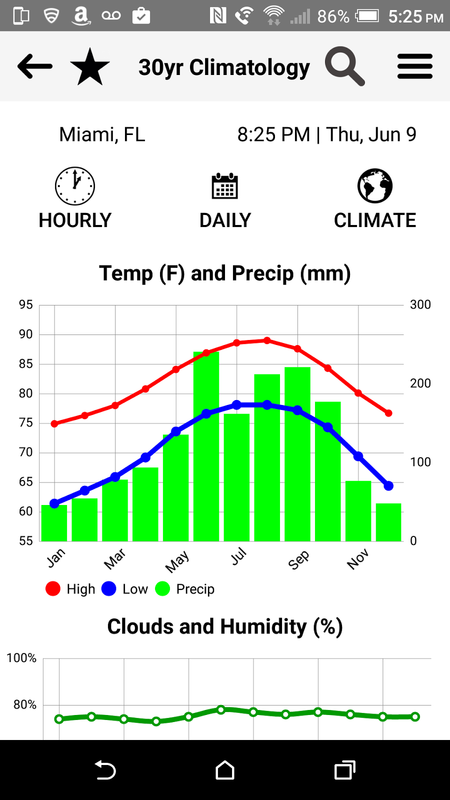 The climatology of any location. 3. 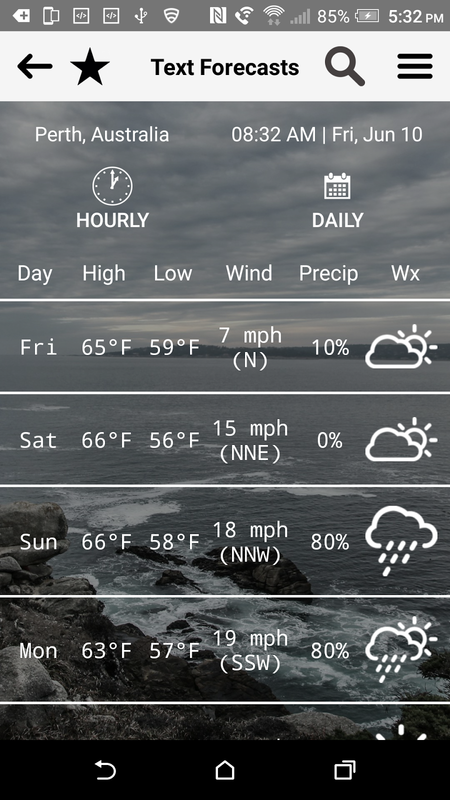 Five day forecasts at your current or other location. Including forecast maps. 4. 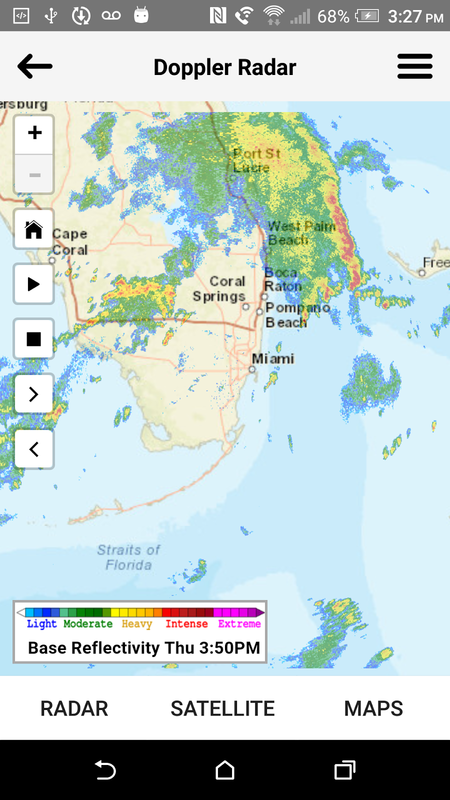 High resolution radar and satellite imagery (high-resolution radar imagery is normally not available in free weather apps). 6. Want the best altimeter around? 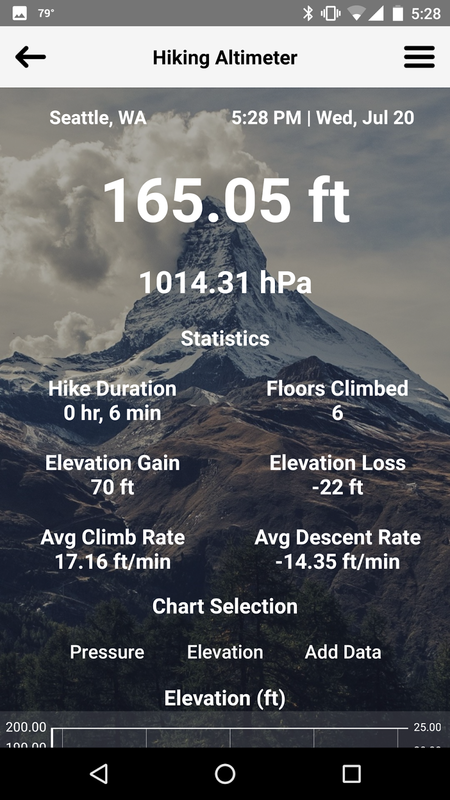 This app tells you exactly how high you are, and even plots your progress over time. Hikers should love it. And the heights are MUCH better than you will get with GPS. 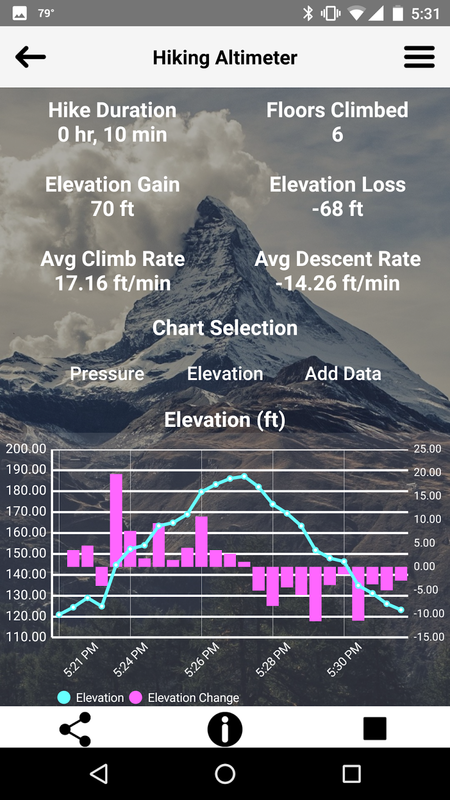 I have only touched upon a few of the capabilities of this app, which currently is only available for Android smartphones. It has been designed to minimize battery demands. Currently, there is a small group of folks testing it (about 500), but we need to increase that number dramatically. And many of the features of this phone work anywhere around the world. During the initial few weeks there will be only U.S. downloads, but full international access will be available soon. If you want to try it, please go to the Google PlayStore and download it. 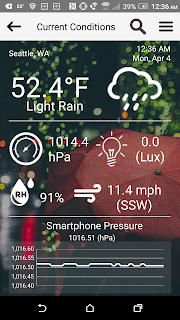 If you are in a position to encourage Google or Apple to get interested in helping weather prediction, send me an email (or leave a comment on this blog). They could greatly contribute to better weather prediction if they wanted. Hardware manufacturers (e.g., Samsung, Xiaomi, Lenova, etc.) could do the same. Although our new app is completely free, contributions (deductible) will help enhance our research efforts are very welcome. Click here. We are doing this on shoe-string budget and additional funds would really help (bringing in more help). There is something about West Seattle play fields that attracts rotating air. On Sunday around 3:50 PM, a "whirlwind" struck the Highland Park playground of West Seattle (see West Seattle Blog feature below). A scene of disarray and disorder ensured. Wood chips were lifted and swirled into the air, some of which embedded in the clothes of parents and children. Picnic makings were thrown about. Blankets and clothes were blown into the air. A kite was lofted and never seen again. Reminiscent of scenes from Sharknado3. There is little doubt that a phenomenon known as a dust devil hit Highland Park that afternoon, on an otherwise sunny day with only a few cumulus clouds. No tornado, since that the feature is associated with tall cumulonimbus clouds. Dust devils are not rare phenomena, often seen in desert and arid climates. They are associated with rotating thermals of upward moving air, with winds that can reach 30-50 mph over a very limited area (usually the diameter of the devil is 5-10 feet). Generally thermals form under sunny skies, since that results in solar warming at the surface. They also favor light wind conditions in an area of relatively uniform surface characteristics. As shown in the map below, Highland Park is on the "plateau" of the West Seattle uplands. It is a large park with an extended open/grassy area that has a good exposure to the sun. As reported by park goers and confirmed by the Space Needle Cam at 3:50 PM, there were a few cumulus clouds over the park at the time: a sign of an unstable atmosphere with upward moving thermals (that is what produces the cumulus clouds). Where does the rotation come from? 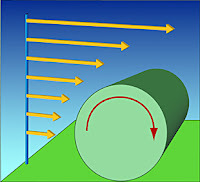 One source is the vertical wind shear (change of wind with height). 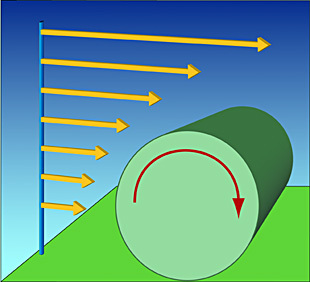 Such wind shear can produce rotation around a horizontal axis (see figure), which can be realigned into the vertical by upward motion. 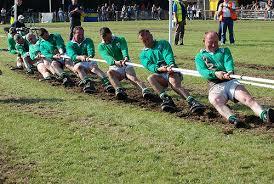 Obstacles can also induce rotation about a vertical axis. Perhaps the most famous dust devil interaction with children occurred in China, in which one child was lifted into the air in April. As noted earlier, West Seattle has a history of whirlwinds hitting gatherings of children. For example, inn 2001 what was apparently a weak tornado hit Gatewood Elementary School, lifting a few kids into the air. Fortunately, teachers had firm grasp on each child and none flew as high as the Chinese child above. 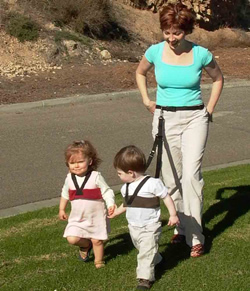 Parents are well advised to hold on to their kids when visiting West Seattle parks and playgrounds. Because of the persistent whirlwind threat in the area, a number of West Seattle parents, concerned with their kids well being, have turned to safety devices recommended by the National Weather Service, as part of the KidSafe Program of the WeatherReadyNation effort. According to leading climate scientists, because of the profound surface heating associated with human-caused global warming, we can expect such incidents to increase in the future. Thus summer, with persistent marine air and northwesterly flow, convection and thunderstorms have generally been absent over the Washington and Oregon Cascades. But that is probably going to change a great deal today (Sunday) and tomorrow, as unusually unstable air and a weak upper level trough combine to produce instability and thunderstorms over the Cascades. And perhaps, just perhaps, some of the storms will roll into the far eastern suburbs of Puget Sound later today and tomorrow. The first ingredient one needs for thunderstorms is the potential for vertical instability, whereby if an air parcel gets pushed upwards, it will keep on going, rather than fall back to its original elevation. A good measure of the potential instability and the ability of an air parcel to convect upwards when pushed upwards is called CAPE (Convective Available Potential Energy). Knowing this term will not only impress your friends and endear you to meteorologists, but is useful as well. Around the Northwest during summer, CAPE values are generally low (zero to one hundred) most of the time. Why? Because of the dense, cooler marine air at low levels, modest lapse rate (change of temperature with height aloft), and relatively dry air in lower troposphere (no warm, hot Gulf of Mexico air for us!). In contrast, in the Midwest CAPE values often get to 2000-3000 and sometimes much higher (4000-5000). That is why they get a lot of big thunderstorms and we don't. But today and tomorrow our CAPE values will surge. Let me show you. Now Midwest meteorologists might laugh at this, but our CAPE values get to around 1200-1400 both afternoons. All we need is some lift to release the instability. The classic way around here is to have an upper level trough (low pressure) along the coast, with southwesterly flow in the mid to lower atmosphere. The 500 hPa (roughly 18,000 ft) chart for 5 PM today shows we have this feature (although not a particularly strong trough). But good enough to get some action. So let's examine the precipitation forecasts from the latest UW high-resolution WRF forecasts for the 3-hr period ending at 2 PM and 5 PM (below). You can see the precipitation over the mountains, some of it moderately heavy. We can use the model output to simulate what the cloud field would look like in an infrared satellite image. Here is the simulated view at 5 PM today. Looks like the anvil clouds from thunderstorms to me over the WA Cascades, Olympics and BC mountains. More action is in store for tomorrow (Monday) as well: here is the forecast precipitation for the 3 hr ending 5 PM Monday: wet in the Cascades, including its western slopes. Looking at the Cascades at 9:30 AM, there is only some shallow cumulus, but we should expect dramatic changes during the next 6 hours if the models are correct. I am heading out to do some biking with friends in the eastern suburbs of Seattle, perhaps I can do some storm chasing as well. Is the Blob Really Dead?